Between my son’s upcoming birthday and the holiday season in full swing, my oven has been going nonstop. I’ve been crossing items off my to-do list only to find more keep appearing. Despite being so busy, I find getting lost in cooking projects in the comfort of my kitchen to be one of the most relaxing things in the world. Once I figure out my recipe and oven rotation, I get in a groove, and nothing beats the satisfaction of accomplishing a task. 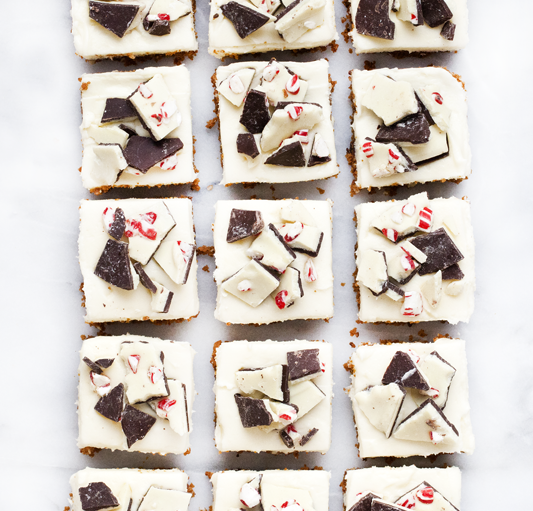 To take a little pressure off all that pre-heating, I made a batch of no-bake peppermint bark gingersnap bars. 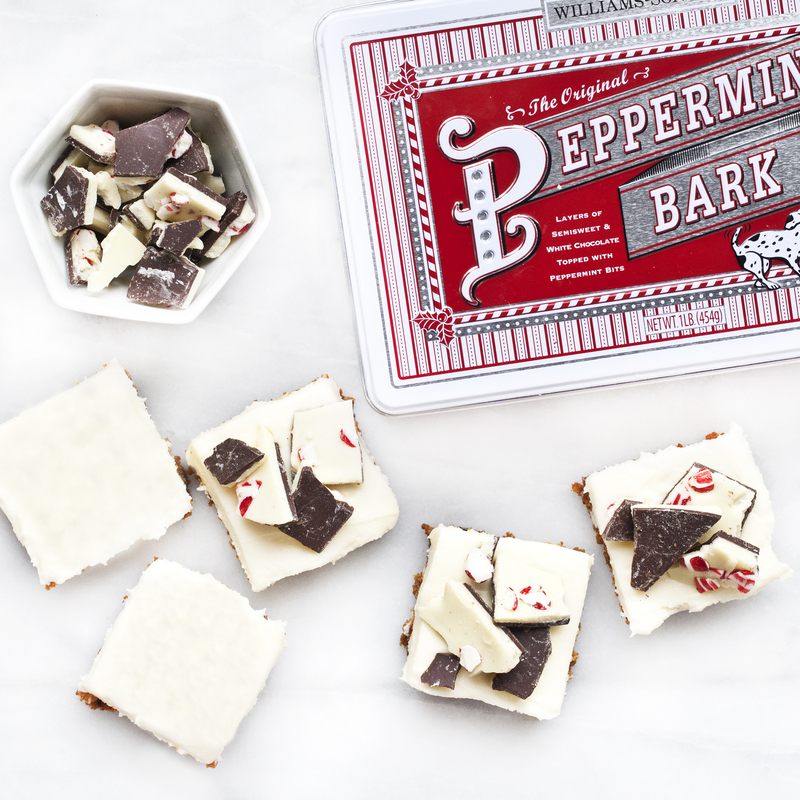 I partnered with Williams Sonoma & TheFeedFeed to share this recipe using their limited edition Peppermint Bark. With the help of melted butter, I pressed gingersnap crumbs and finely chopped bark into the bottom of the pan for the crust. Then I spread on a layer of cream cheese frosting and added shards of the dark & white chocolate peppermint candy bark. Line an 8-inch square baking with pan aluminum foil and grease with non-stick cooking spray. For the crust, stir together the melted butter, gingersnap crumbs and finely chopped peppermint bark. Press the mixture into the bottom of the prepared baking pan. Using an electric mixer beat the cream cheese and butter until light and fluffy followed by the vanilla extract. Gradually beat in the confectioner’s sugar. Spread the cream cheese frosting on top of the crust. Chill in the refrigerator for 30 minutes. Lift the bars out of the pan and cut into 16 squares. Top with broken pieces of peppermint bark. Store the bars in an airtight container in the refrigerator. They are best served chilled. This post is sponsored by Williams Sonoma and FeedFeed.